Want to start your own blog (or an online publishing website), but don’t know where to start? Here’s a list of just the best online blog news and magazine themes for WordPress. How will you choose the best blog theme from among them? This list of the best news magazine themes 2018 is like a brochure of themes and with a brief information about each one. You can check the ones that meet your requirements and ignore the ones that don’t match your criteria. 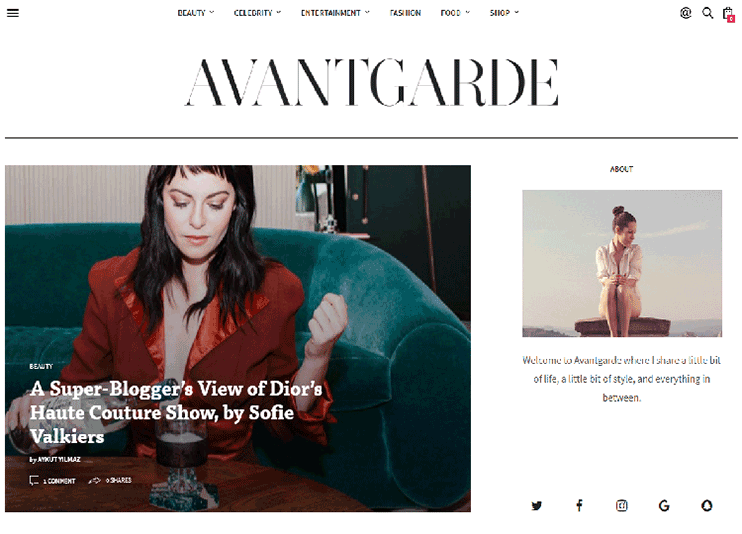 We have picked up just best blog themes and best WordPress news magazine themes of 2018 in this article to help you find the best theme for your new venture. You may also like – Our in-depth guide on blogging for beginners. The Newspaper WordPress theme is the ultimate blog, news, and magazine template for WordPress. This is the best selling news and magazine theme on Envato Market in 2018 with over 65,000 customers. The template is designed to help you create everything with ease. From a small blog to a high volume traffic online newspaper, you get all the tools you need to be creative and productive in a single theme. The latest versions of the theme feature an eye-catching design powered by a live drag-n-drop page builder – tagDiv Composer. 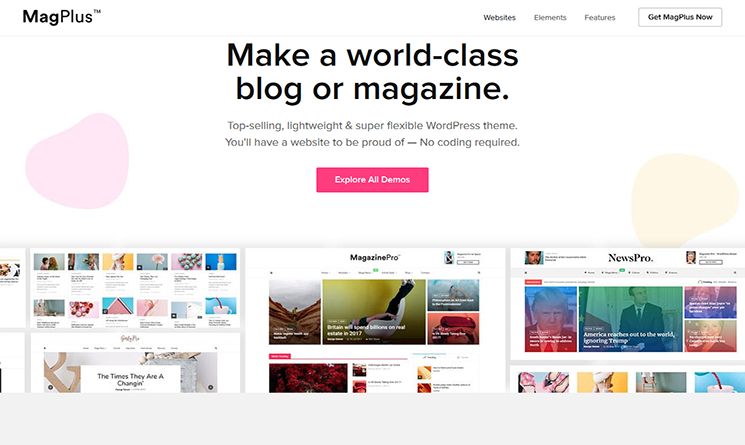 This is the only page builder ever built for the publishing industry so you’ll get the chance to explore, test and redesign your website right from the front end without any coding skills. Also, the theme includes the new tagDiv Cloud Library that comes with 420+ ready-made templates for posts, category, 404, author, or search pages. Now, everything can be customized on the front end of your site! The Newspaper WordPress theme comes with 50 demos you can install with a click for a fast start. To make it even easier, the Newspaper magazine theme brings you 35 different post style templates, so you can choose the one that presents the story in the best possible way. The theme also has Video auto-play; it is SEO friendly, AMP and AdSense ready. 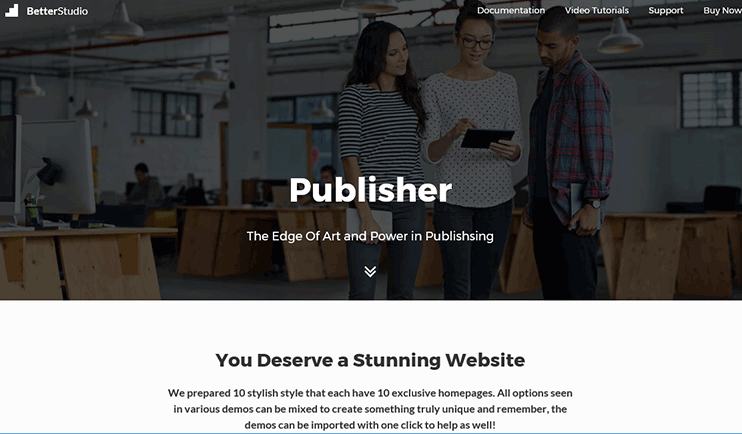 Publisher is a news magazine WordPress theme with vast features and a thoughtful design. The theme comes with intuitive dashboard options so that you can manage your online news portal website or e-magazine easily. The theme is compatible with WooCommerce for all the eCommerce features you should need. Furthermore, you can start community discussions with the bbPress forums. Also, for creating new pages, or editing them, you can use the Visual Composer drag and drop page builder. You can choose from more than 200 home screen layouts. Also, it comes with ad sections for ad monetization. This WordPress theme for news blogs is speed and performance optimized. It is SEO optimized and also allows facebook comment integration on your articles with Disqus. You can even create and use custom post types and is multi-site ready. Sahifa is one of the best news magazine WordPress theme for 2018. The theme is an amazing platform for creating website in RTL Mode. For customizing the theme, Sahifa offers more than 400 options. The theme has its own page builder called the TiePage builder. This tool will let you re-structure the content blocks using simple drag and drop. The theme has a social counter plugin. Sahifa offers your visitors the facility to search your site by using the ajax search. To add more blocks and features there are 40+ shortcodes available with the theme. There are widgets in the theme that you can use for various purposes. Besides everything, Sahifa is SEO friendly and performance oriented. With the Sahifa, display breaking news on your website with three animation effects. With translation ready Sahifa, create a website in your desired language. If you wish to sell something through your website, Sahifa offers compatibility with WooCommerce. By integrating WooCommerce, you include all the sales related functionalities. Introducing a fresh, clean, and easy to use WordPress theme for all the food bloggers. 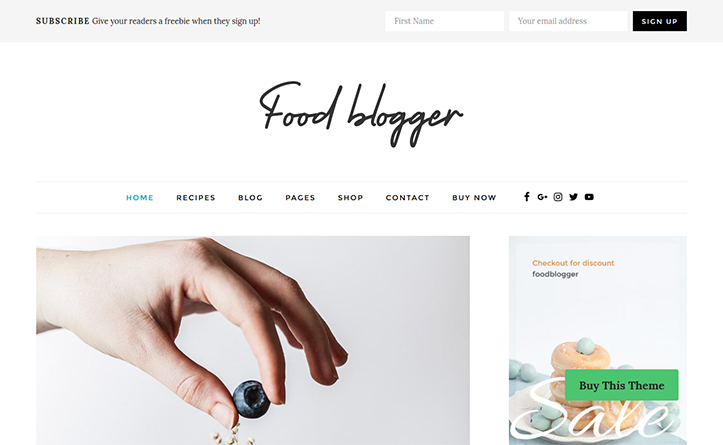 The multipurpose WordPress food blog theme is ideal for Recipe sharing websites, cooking blog, or any other food related website food-related blogs, magazines and recipe websites. The flexible food theme with drag and drop Elementor page builder support makes it easy to shape the food blog of your imagination. The theme is clean and SEO friendly and compatible with popular plugins like WooCommerce where you can show online shop for your site. The theme is easy to set up with one click install and have unlimited color customization options and Live customizer available. Gillion has been designed to have powerful theme options whereas an admin of the site you can control the settings and modify changes as per your needs. The theme is well optimized and SEO friendly. This free Magazine WordPress theme lets you customize the look and feel of your site. Instead of bombarding you with endless options, it gives you primarily, secondary color choices to globally change the colors across your site. 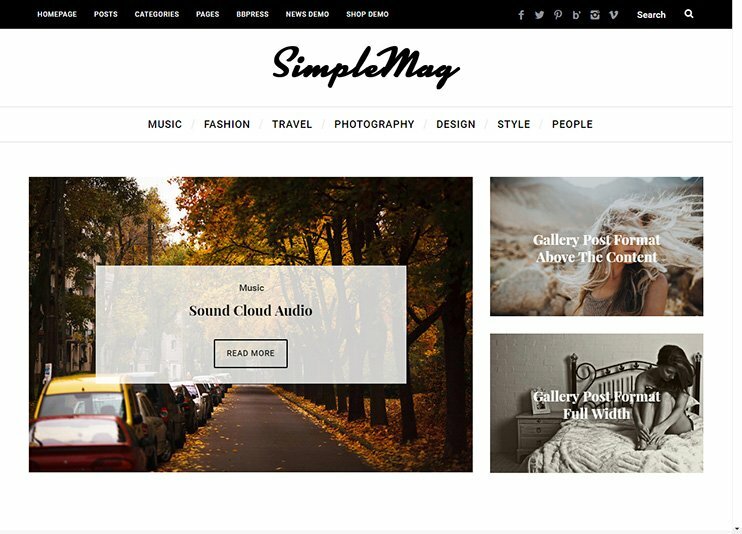 SimpleMag is a WordPress news magazine theme. SimpleMag has around 9 Homepage variants to choose from. Install the demo data with one click and get started with your website. This theme has a modern look and clear presentation of the content. A magazine needs to present all the categories to the visitors on the homepage itself. So, the theme comes with an ajax mega menu with columns. SimpleMag also has some Ad spaces to display advertisement and earn revenue. For customizing the theme, the powerful admin panel has intuitive options. You can use available widgets and shortcodes to show content at various parts of the website. The theme has a drag and drop page builder to let you control the content blocks. So you can construct a page with your own imagination and creativity. The theme design is responsive. SimpleMag can perform well in the RTL mode too. Moreover, SimpleMag is designed with SEO standards in mind. 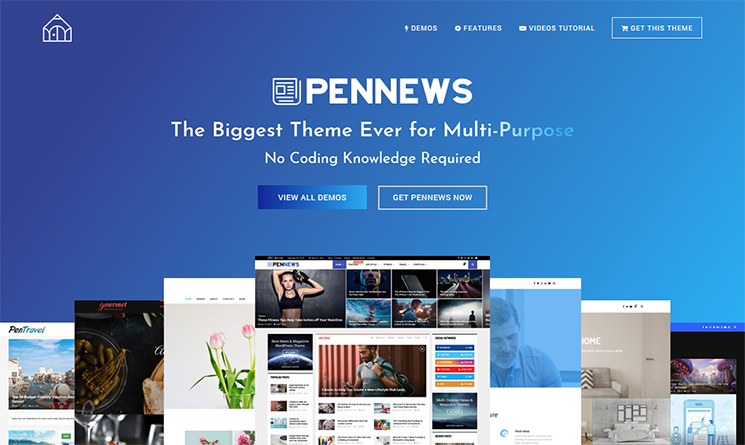 PenNews is a multi-concept drag and drop WordPress theme. The theme can be used for Travel agencies, business, food, blogging and many more. The theme is well supported with Google AMP to have better performance on responsive devices. The theme comes with elegant features like frontend submission page, custom post types options, multiple layouts and animations that you can choose from to design your own creative website. PenNews is Gutenberg compatible and helps you create your own styles. The theme has video, galleries and slider styles and more than 100+ custom blocks that you can choose from to design. Compatible with BBPress, BuddyPress & Event Calendar plugin along with the WPML plugin to have a multi-language supported site. 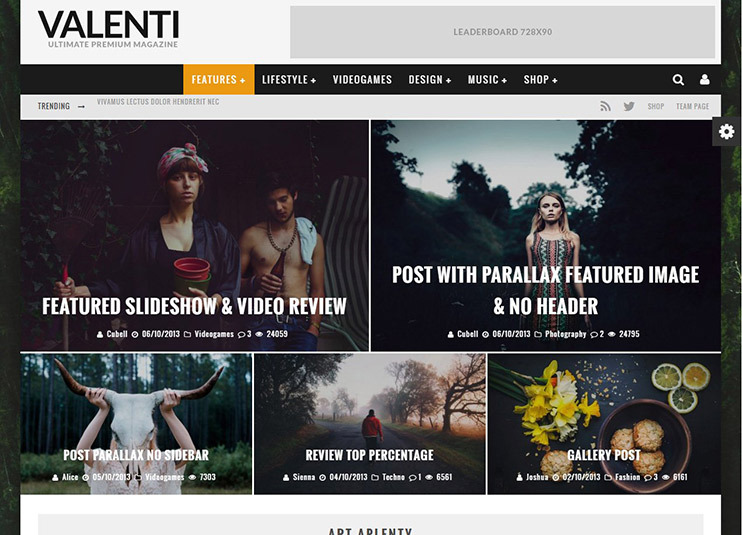 Valenti is a retina ready and easy to use reviews and magazine theme. The theme is responsive and supports high quality graphics. So that you can create wonderful websites in 2018. This theme comes with its own inbuilt page builder called the Valenti page builder. This page builder will allow you to build your page using the easy drag and drop options. Valenti has different styles to offer, to present your post on the website. Being a review theme, it allows you to choose the review style: Stars, percent or point system. There are many options in Valenti specific to the news and magazine. For advanced customizations, you can use a child them. Valenti is translation ready and comes with inbuilt .po and .mo files. Valenti is SEO ready and RTL compatible too. You can sell online with the Valenti by installing the WooCommerce plugin. 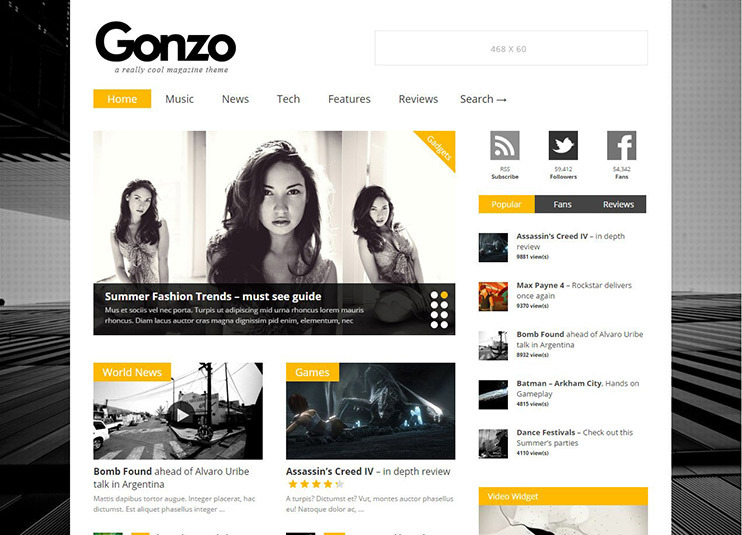 Gonzo is a theme specifically designed for news, blog and magazine website. The theme has all the features to let you set the blog website with easy and flexibility. Gonzo has a clean design and its responsive. The elements of the theme are designed to ensure that they appear perfectly on any device they are viewed. There are blog layout styles you can choose from. The theme gives you the freedom to present the content the way you want. To present the images within the blog, you can use the Gallery module. With Gonzo, you can decide what you want for review systems. Your site can start with forums using the bbPress plugin. 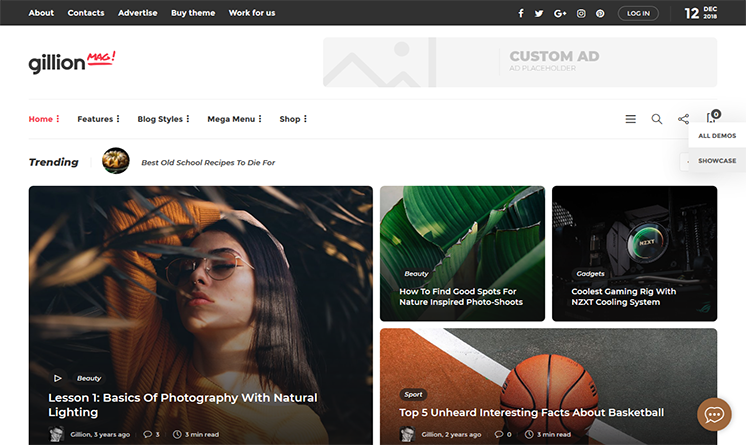 MagPlus is a popular WordPress theme especially designed for Bloggers,Travel agencies and portfolios.The theme has many elegant designs and demos that you can choose from to design your own creative website.The theme has popular features like AMP,GDPR compliant,Adsense,WPML,Responsive,SEO Optimized and many more. MagPlus theme has tons of features using the Drag and Drop page builder like Visual Composer,Live Customizer and multiple templates with 1 click install and premium plugins like Visual Composer, WordPress Viral, Quiz Plugin,Yellow Pencil Plugin,Social Jumbo Pack included as FREE plugins. Bimber is a popular and light-weight easy to use magazine wordpress theme.The theme comes with many features which you can use for your creative blogging site.Custom Video Playlist,Adblock Detector,Social Media Widgets,Fake counters and reactions on posts are key features using this theme.The theme is clean and easy to customize & well documented. 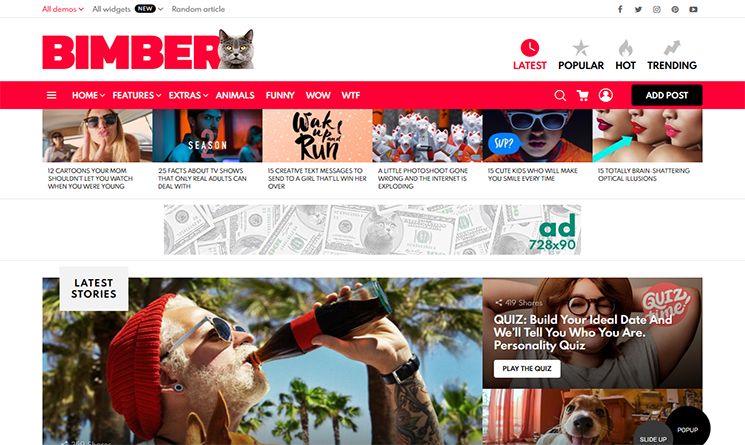 With Bimber, you can monetize your site using Google Ads and other methods like affiliates,coupons,donations,shop and many more.The theme comes with 15+ pre-defines demos to start with and easily customizable with drag and drop page builder. BoomBox is a popular blog/magazine wordpress theme designed for bloggers.The theme is easy to use and customizable layout with viral content builder plugin.Compatible with BBPress,BuddyPress and Premium plugin like Ad Manager plugin,Visual Composer makes this theme more elite and well customized theme.It includes enhanced wordpress customizer options with advanced sidebar management options. 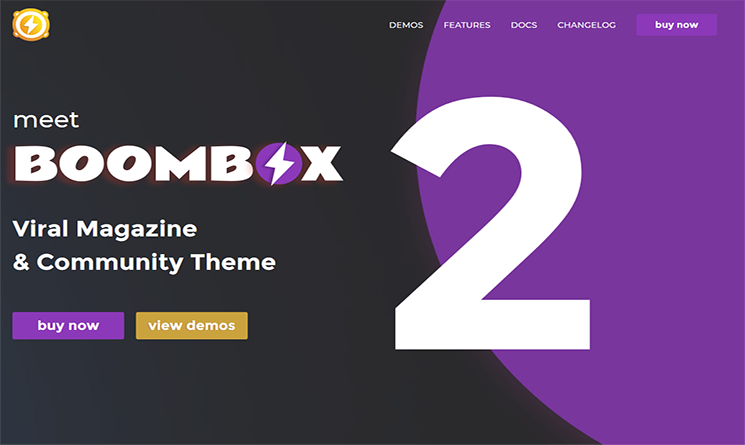 BoomBox includes attractive badges and post ranking options where you can add fake counters and views for making your post popular.The theme is well optimized and SEO friendly.Other features like WPML,Contact form 7 and Fully Responsiveness are included in this theme. Cheer is a powerful and luxurious design WordPress theme designed for bloggers and minimal magazines types of sites.The theme is specially designed for Gutenberg and includes 100+ layouts and designs to choose from to design an attractive blog website.Features like header & footer styles and 10+ unique demos which can be installed in one click to start with a creative blog site. CheerUp is fully responsive and SEO friendly and comes with GDPR compliant along with multiple latest header and footer styles.The theme is compatible with Visual Composer plugin,WooCommerce,Contact Form 7,Yoast SEO and many more. Typography is a content based gutenberg compatible wordpress blog theme.The theme is well optimized and SEO friendly.The theme is clean design and fast loading with full responsive layouts.The theme has multiple Custom page title styles on per-page basis,Page and post options,Smart sticky menu,Useful widget areas,Sticky sidebars and many more features. Typography WordPress Blog theme is well supported with CDN and developer friendly. The theme comes with a child theme where you can customize or design your own theme.It is SSL ready and cross browser compatible. 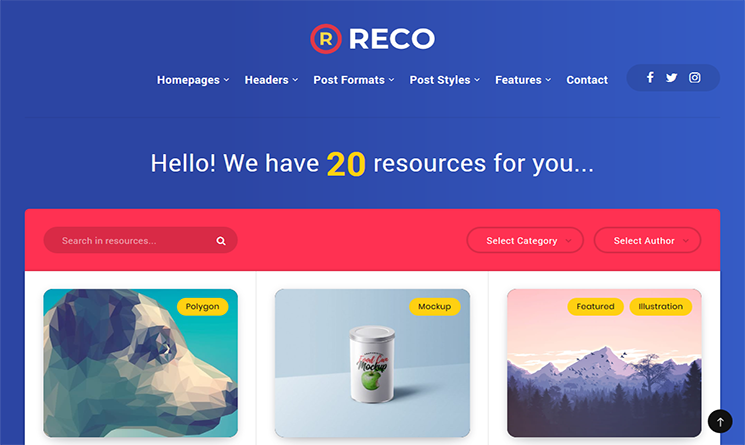 Reco is a popular minimal design blog wordpress theme designed especially for magazines, blog, digital freebies, mockups and others.The theme is easy to use and has been designed light weight to have a well optimized score based on SEO.The theme is fully responsive and translation ready and well supported with WPML plugin. The main features includes multiple homepage designs and layouts with customized widgets designs.Reco has search widget,customizer options and powerful admin panel to control the site as an administrator. Zeen is a popular next generation magazine wordpress theme designed to create a beautiful, silky-smooth and highly unique magazine, blog, newspaper, reviews site or even full blown WooCommerce shop.The theme is very much flexible and customizable for any developers and even beginners can become a tech savvy using this theme with no coding skills required. 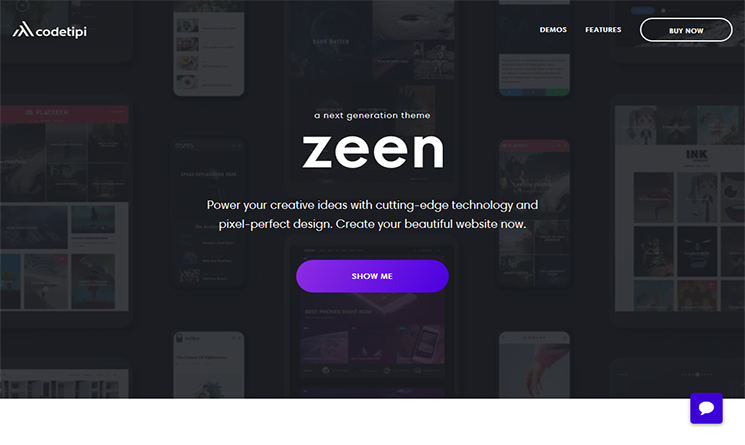 The theme is very much responsive and well documented and can have a features to import demos with one click install feature.The theme is compatible with WooCommerce,AMP,BBPress,BuddyPress and many more.Zeen is GDPR compliant and well optimized with SEO. 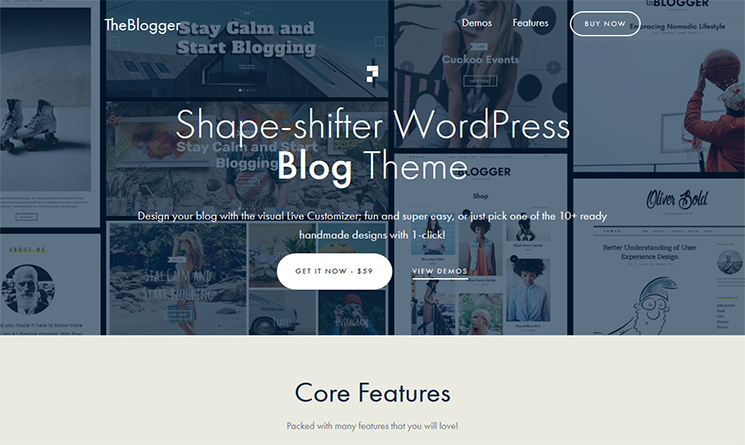 TheBlogger is a wordpress blogging theme especially designed for bloggers.It is easy to use with live customizer option where you can customize every bit of changes and preview it on your site.It supports multiple header layouts & styles and compatible with WooCommerce plugin to create an online shop on your blog site. It is very much responsive and mobile friendly.The theme includes many features like SEO friendly,custom widgets options,Translation ready,advanced admin option panel and many more. 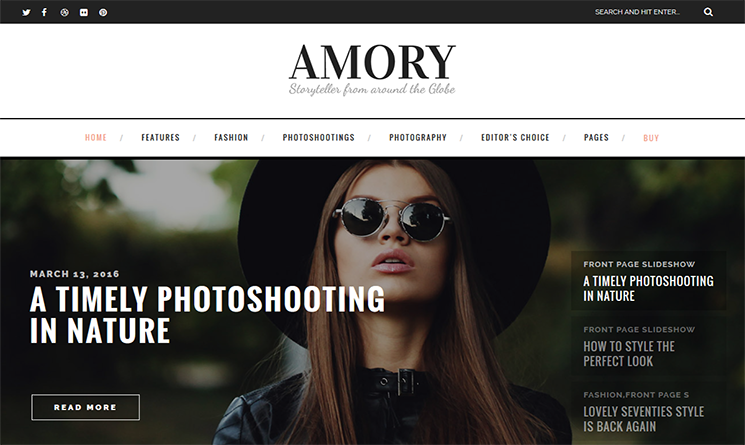 Amory Blog is a modern design responsive wordpress blog theme especially designed for fashion,travel and photography websites.The theme is fully widgetized and have powerful admin panel to control the theme settings.It consists of multiple sidebar options and having shortcode functionality to choose from.The theme is clean and well documented and requires no coding skills.It also consists of multiple blog styles and supports premium plugin like Revolution slider. 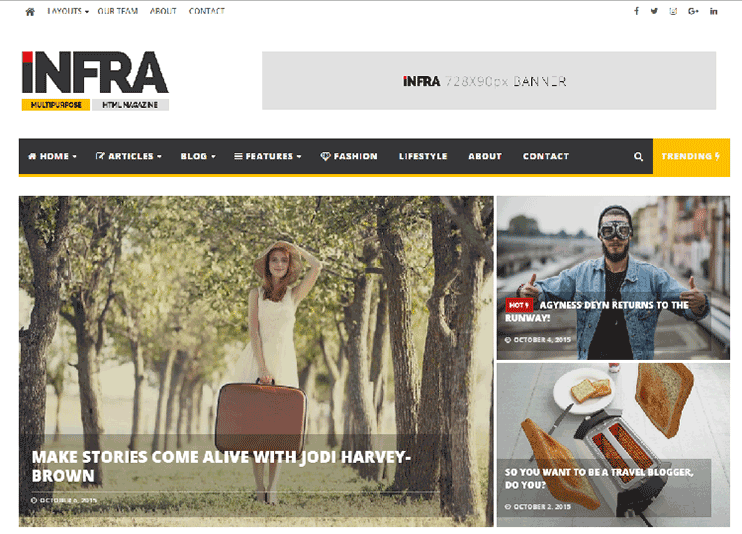 Jarida is a responsive and retina ready WordPress news magazine theme for 2018. 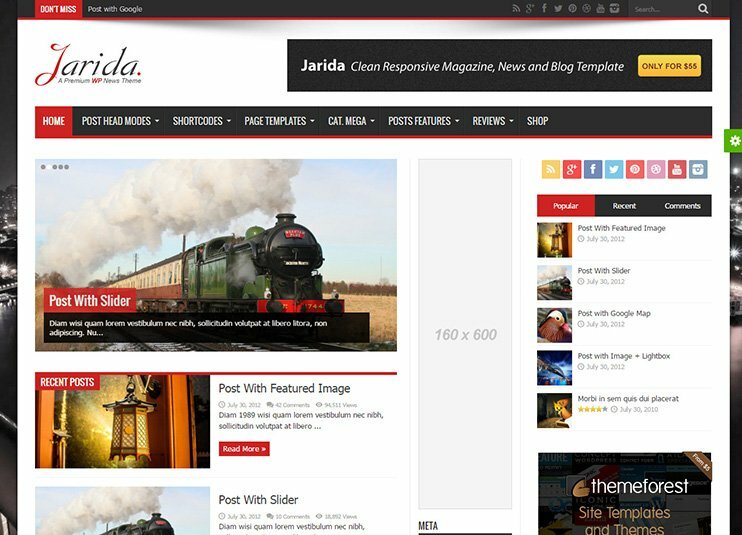 Jarida contains built in page builder using the drag and drop options. The advanced admin panel of the theme has more than 200 options for customizing the theme. Jarida supports multiple page posts to be displayed on your website. It supports mega menu to display the categories on the homepage menu. The theme has many options to select the header, footer, sidebar, sliders, page layout or create it. Jarida is translation ready and WPML compatible for the multi-language translation. Jarida also has a social counter widget to show the social popularity of the theme. The theme files have clean code and is well commented. Jarida ensures you that you can create a fabulous website in RTL mode. The built in short codes, are useful and intuitive. There are widgets, that too can be used for your purpose. The theme files are SEO optimized. 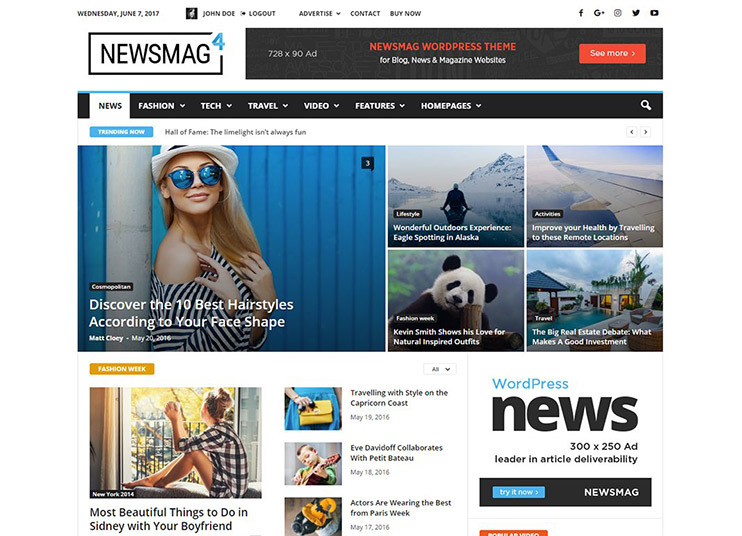 Newsmag by tagDiv is an excellent theme specially designed for news and magazine websites. The template has enough customization options, so you don’t need to go and change the code to make the site as you wish. The smart advertisement system lets the owner earn money by displaying advertisement in the theme. You should go with this theme if you want to have a responsive, attractive and easy to use news or magazine website. The theme is highly customizable and comes with various post styles to choose from. You can choose from the available demos to get started with. Newsmag is extremely flexible and lets you create whatever you want with easy options. The theme is compatible with WooCommerce, BuddyPress, and Visual Composer plugin. The Voux is a stylish and detailed news magazine WordPress theme. The theme is Lightweight and focuses on content. It lets you create a professional magazine website in minutes. The theme comes with pre-made demos and Visual Composer compatibility for easy drag and drop page building. It lets you choose from multiple header styles. This Magazine theme is compatible with WPML as well so you can easily view the site in any language you want. Jannah is one of the best WordPress news magazine themes with great features. 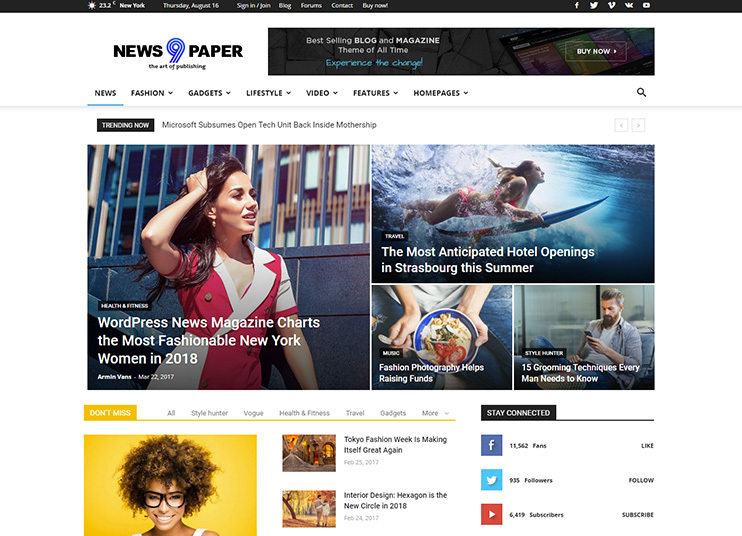 This newspaper magazine theme comes with multiple header block styles and new elegant design. The theme is highly customizable and SEO friendly. Moreover, you have some very useful widgets like the weather report, etc. 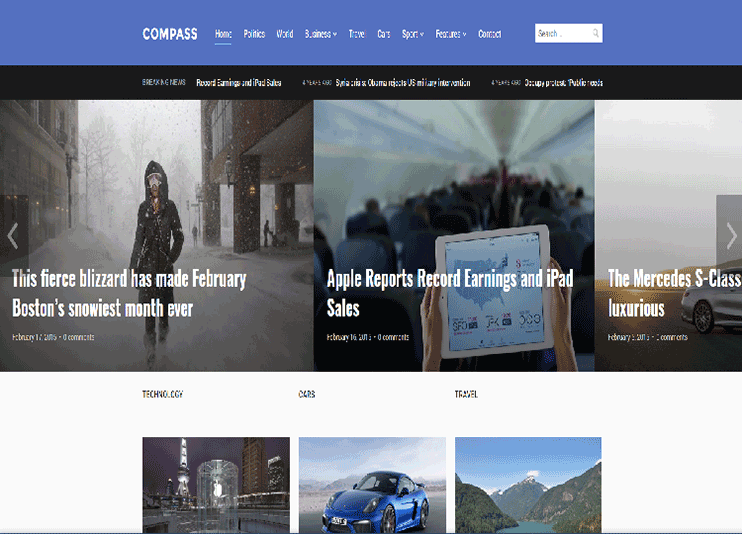 The Compass is a highly elegant and customizable WordPress news magazine theme that Comes with a modern responsive design. It lets you show off your content with the easily configurable homepage. Besides, you can use the drag and drop visual composer page builder to create your web pages easily. You can use the compass theme and create your own website without hiring experts. Use the customization options to make your website look and feel the way you want. 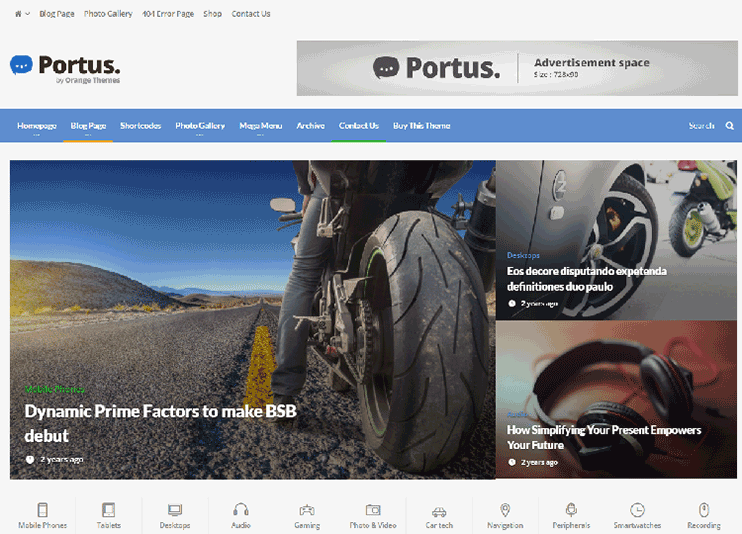 Portus is a news Portal theme that comes with clean code and easy to use features. This news magazine WordPress theme is easily customizable. Portus supports WPML for multilanguage translations, and WooCommerce for eCommerce features on your website. Moreover, you can use the Visual Composer plugin to redesign your web pages with easy drag and drop options. This news magazine theme is fully responsive and supports mega menu for flawless navigation. 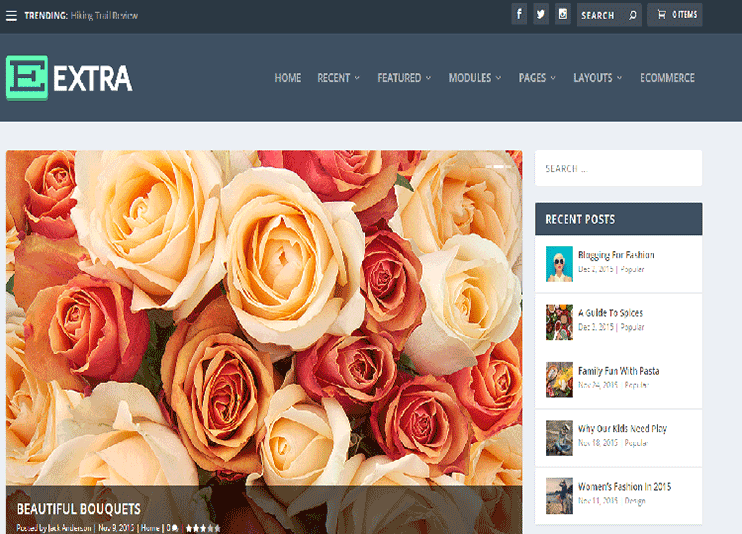 INFRA is one of the most popular news magazine themes where you can easy to use and customize your site as per your needs.With advanced features like SEO and Responsive Friendly you can install this theme on one click. This theme is compatible with the Visual composer drag and drop page builder so you can easily create your own pages and design your site as per your requirements. Besides you can set custom Sidebars, and background and images to make your website more attractive. 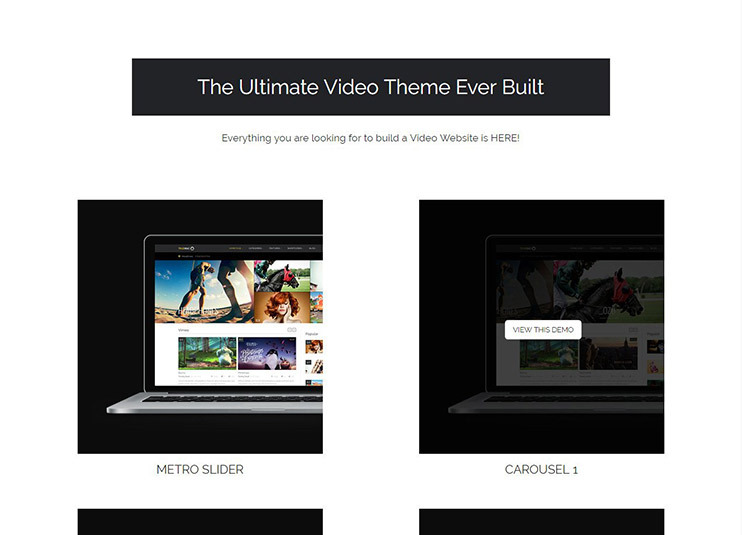 The ultimate visual page builder magazine theme that you can use for your site. Install the theme and create your own news categories, post and pages with the page builder. This News magazine theme is easily customizable. You can use this theme to sell online using the WooCommerce plugin. Extra is fully responsive, mobile friendly and cross browser compatible. 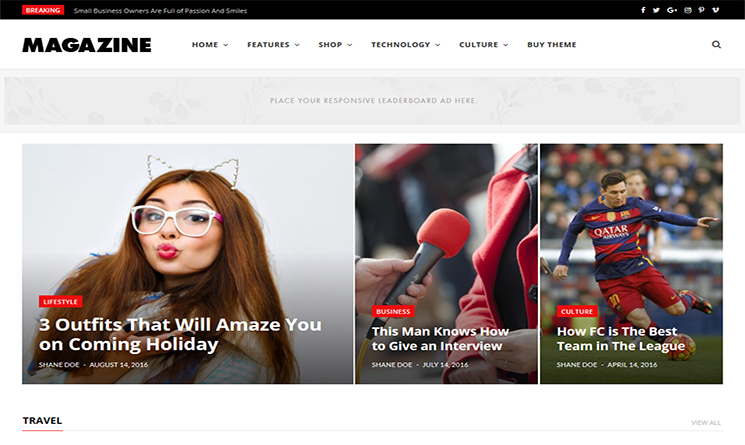 This is a modern news Portal & Magazine theme specifically designed for news and magazine readers The theme is fully responsive and it comes with all the easy options through which you can create your website without writing a line of code. 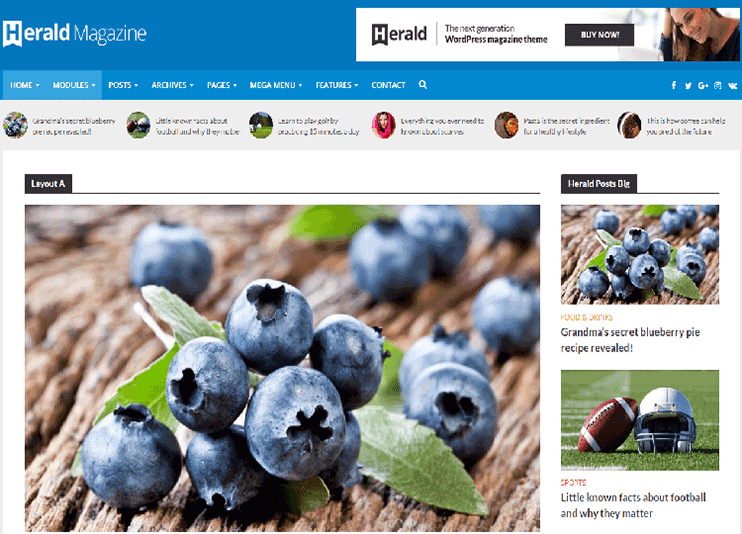 The Herald news magazine theme comes with unlimited sidebars and multiple page variations. Create a multilingual news magazine website with this WPML compatible theme. Good Space has a simple design that focuses on the content. The theme is not particularly designed for news and magazines. But it offers everything to establish a feature rich publishing website in 2018. The inbuilt page builder works by drag and drop. With this page builder, you can create a page of your need easily. For customization of the theme you can use the Powerful Admin Panel or the shortcodes. The shortcodes allows you to create the content areas as per requirement. The Good Space theme allows you to choose from the thumbnail options. There you can opt for the video, image or slideshow of some images. With Good Space the .POT files are already provided. These files lets you translate the theme in any language. To attract the attention of more and more people, the theme supports the social sharing of the posts. The theme has font, logo and background up-loader. This means that customization options are not limited to the choices given in the theme. Good Space theme takes care of your SEO concerns. So you just need to take care of your content without worrying about anything else. 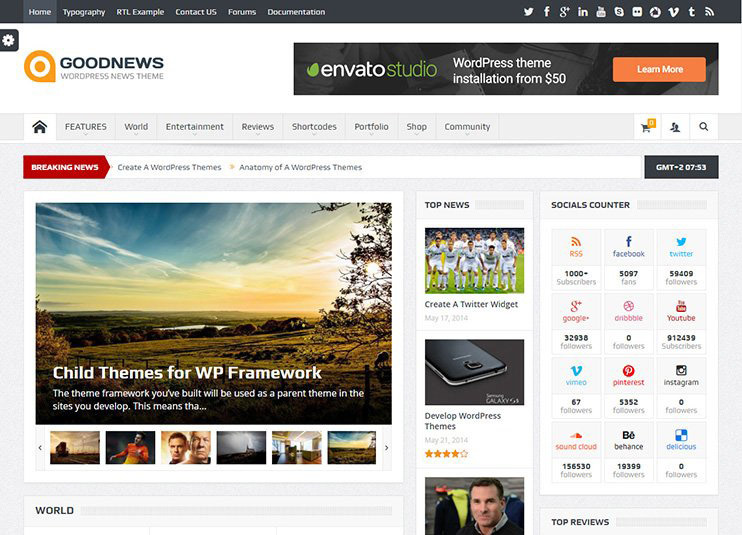 Goodnews is a well designed, news magazine theme for WordPress. The theme offers you a wonderful way to present your blogs and posts. It has an inbuilt smart advertisement system to display the advertisements. You can charge clients for having their advertisements on your website. Good news will let your visitors search through the site using the Ajax search. The theme supports video for displaying news in the website. Moreover, there are other options too for displaying your posts in the website. The theme has a weather widget that will display the temperature and weather widget. The advanced admin panel of the theme makes it easy to change the look and feel of the theme. The visual composer plugin is compatible with the theme. You can manage the content of the website using drag and drop options. Good news is translation ready and compatible with RTL mode. The theme includes Layer Slider and Revolution slider. 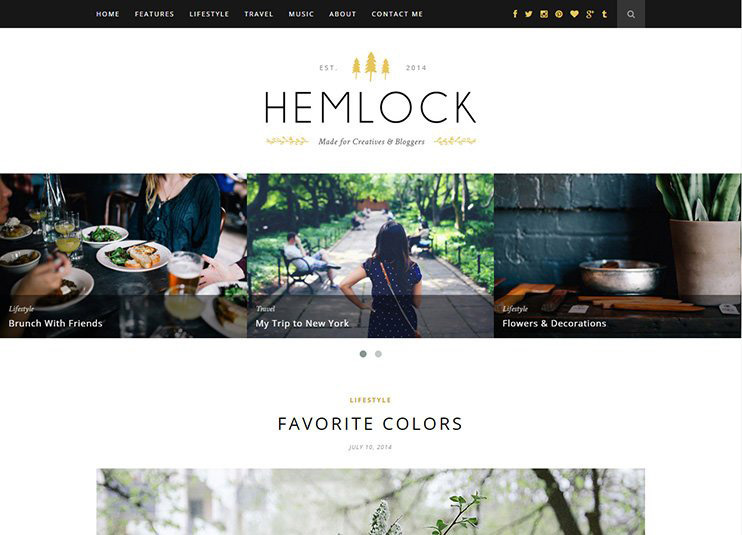 Hemlock is just another WordPress news magazine theme also good for blogging. The theme has a simple yet attractive design with necessary features. The theme does not come with extended functionalities but ensures that you get everything to start up a successful blog. As the theme is not loaded with unnecessary extensions and features, it is quick to load. Hemlock has a design to focus on contents and has eliminated unnecessary details. Professional bloggers, as well as beginners, can start their blog with the theme. The theme has social media icons in to let your visitors share their posts with friends. To ensure that people can access and enjoy the blog and news from any device, Hemlock is responsive. The powerful admin panel of the theme allows you to manage the appearance and behavior of the theme. Hemlock supports Videos, music and image galleries in the posts. 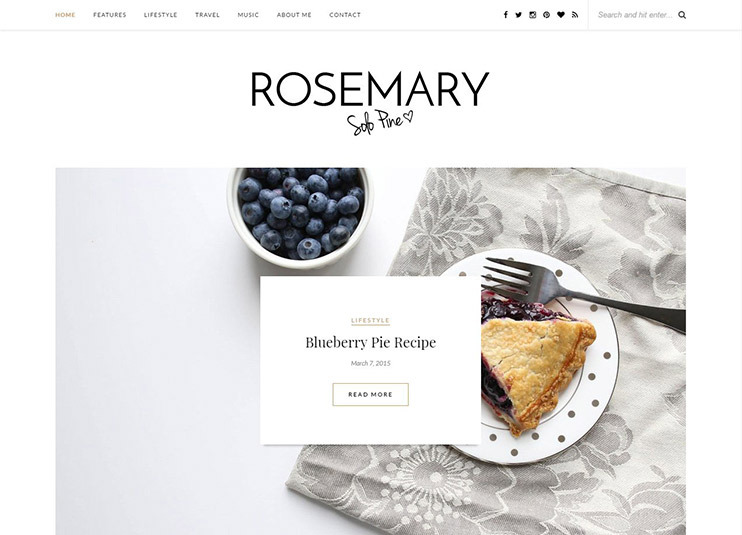 Rosemary is a responsive, and bright WordPress theme for creating a lively website in 2018. The theme is designed for presenting your blogs in an attractive manner. The theme has 5 predefined styles for blog. This means that you can present your content using five distinct ways. Rosemary has custom widgets that will add features necessary to your blog. For example, There’s a Latest post widget that will display the latest post to the visitors. This way the visitors will be aware of the latest posts on your blog-site. For creating forms, Contact Form 7 is compatible with the theme. The theme has a full-width page template to display content without sidebars. You can choose the fonts and colors for the website using the easy admin options. The social media sharing of the blogs is possible through the social icons in the header. This will allow the visitor to share your post on their social media accounts. If you want to create a website in a language other than English, that too is possible. Rosemary comes with localization files to translate the theme in the desired language. True Mag is an amazing premium magazine WordPress theme. You can select from the 11 available homepage slider styles for your website. The theme is responsive and optimized for performance in mobile phones. For signifying the content, True Mag has easy navigation and clear content display. The True Mag theme comes with the Visual Composer built in. So, you can create your page or move and update the content of the existing page with simple drag and drop options. The interesting thing is, it comes in-bundled with the theme. The TrueMag comes with a Video Ads plugin that is designed for True Mag. This plugin makes it possible to play an advertisement video before starting the actual video. To make the videos on the site more interesting the theme has many options related to this. You can choose to display video in a full-width page or inbox. The video auto play and next video auto play feature is also included in the theme. Sharing the posts function also comes inbuilt with the theme. True Mag allows advertisements in predefined ad spaces in the site to let you make money through it. The theme has customization features with innumerable options. You can set the font, color, background, and icons using the admin panel options. The theme is RTL compatible and allows multi-language translations using the WPML plugin. 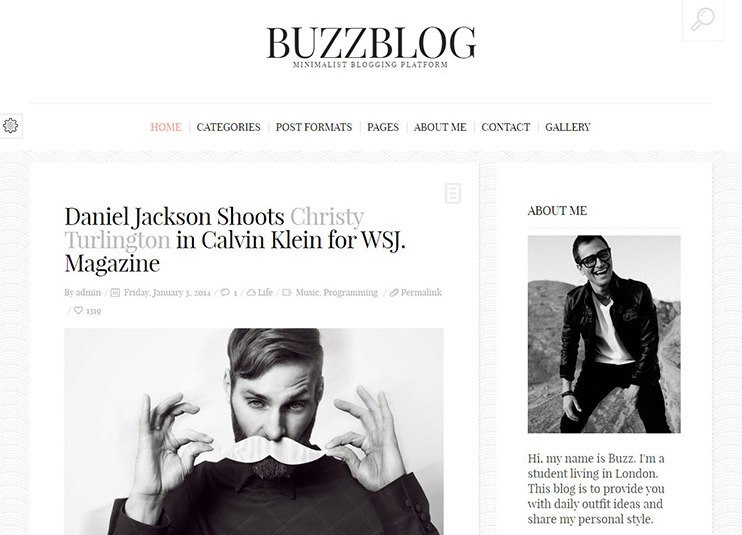 BuzzBlog is a simple and attractive theme for your personal blog. The theme is based on the Bootstrap framework. 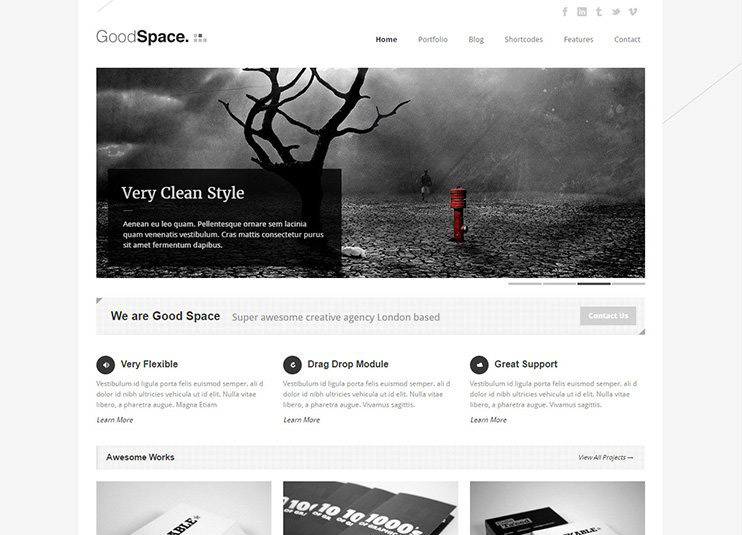 The theme has an elegant and responsive design with powerful graphics quality. Buzzblog has 11 predefined style templates to let you choose from. To ensure that your blog gets the deserved social love, Buzzblog has the social media sharing function enabled. The images on the website, when clicked will be displayed in a beautiful lightbox. To include features in the theme, you can use the 60 shortcodes. BuzzBlog also allows embedding videos in your post. The footer of the theme can be reconstructed as it is totally widgetized. You can replace or edit these widgets for your use. In case you want to display the maps on the website, this theme comes with Integrated Google maps. 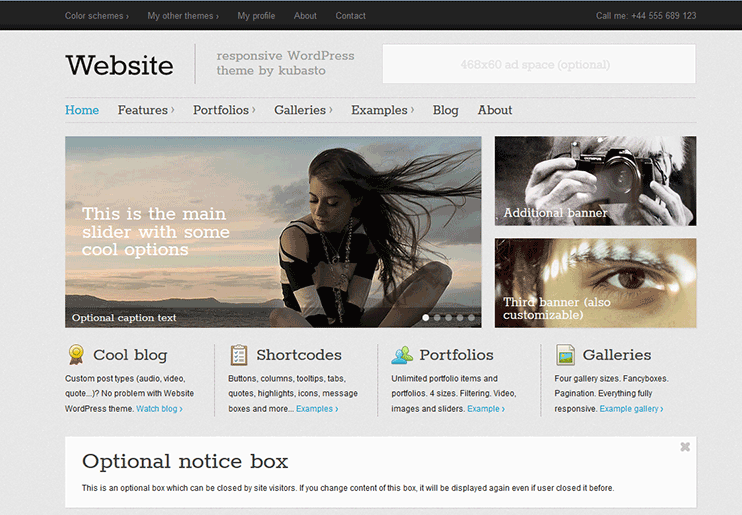 The header of the theme can be totally customized from the theme admin panel. You can choose from the 7 layout options to display the blogs on your website. If you wish to translate the website into any language, you can easily do that. Even multi-language translation of the theme is possible using the WPML plugin. The theme is SEO optimized. Retro Portfolio is a one pager WordPress blog theme. This theme has a single page portfolio system to display the content. The theme allows you to present your blog in one page through its retro design. 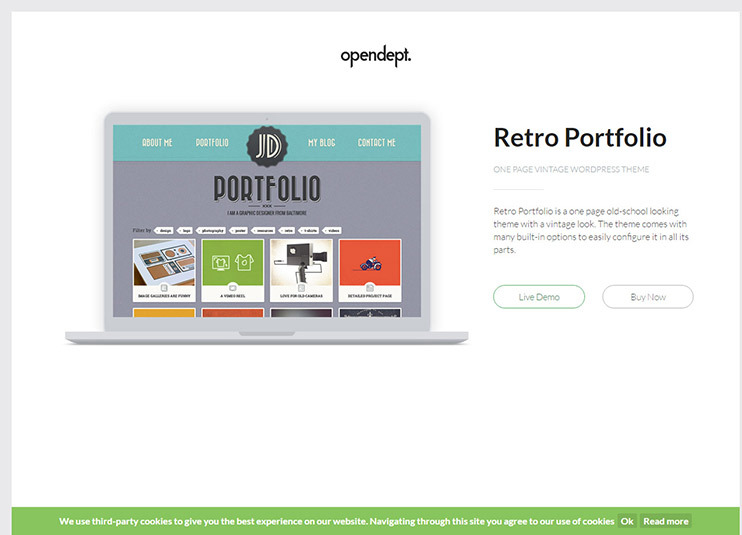 Retro Portfolio has a very detailed admin panel that allows you to control the look and feel of the website. Through this panel, you can change the fonts, colors, layouts, etc. The theme lets you have total control over the home page. This is very important for a one-page portfolio website. With the back-end options, you can control the various sections of the homepage and make the page work the way you want. If you are looking for a portfolio theme to use as your blogging platform, Retro portfolio is for you. The theme is fully responsive. The user experience won’t suffer even when the website is viewed through any mobile device. Retro Portfolio has a working anti-spam filer on the contact page. The theme is translatable. You can use its Vintage design to display the website content in any language. 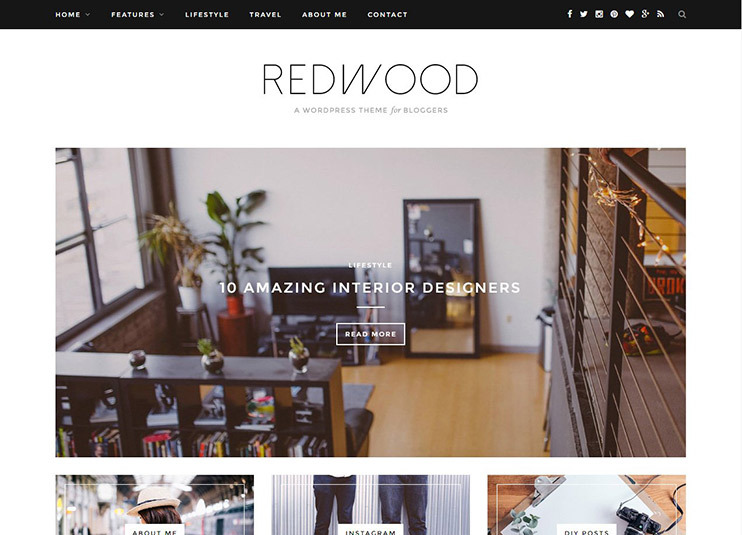 Redwood is a simple yet stylish magazine-blog theme for WordPress. It is perfect blogging platform. It is designed with the bloggers in mind and focuses on content. To make your blog available to people visiting through different devices, the theme is responsive. The homepage banner slider shows the featured posts with an option to read more. The theme has options to customize using the back end of the theme. This customization can range from changing the font and colors of the theme to enable and disable the elements. The theme comes with social media widgets to let the visitors share your post on their social accounts. If you wish to create a website in your local language, that is possible using the localization files provided with the theme. Redwood has a number of custom widgets that add features to your site. The theme has promo boxes to display categories or use as a way for navigation to important pages in the site. Website is a simple and elegant WordPress news, blog and magazines theme . The theme allows you to choose from the dark and light version. The website theme is responsive and optimized for touch gestures. The website supports videos for the content of your site. To display the content using portfolios, the theme offers portfolio styles to choose from. The menus of the theme auto-adjusts themselves in the desktop or mobile phones. The ample amount of the shortcodes allows you to have additional features in the site. The theme also allows the content to be tweaked for the mobile devices. The theme is compatible with the WPML plugin. You can convert your site into multiple language with the theme. The theme also comes with .po and .mo files for translation into desired language. Voice is a theme for creating professional blog or magazine websites in 2018. 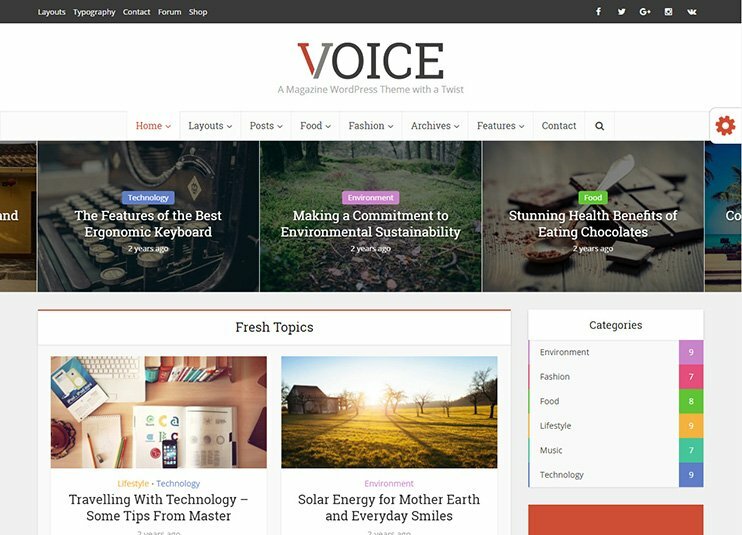 Voice is one of the best selling WordPress news magazine theme on theme forest. The theme has good looks and a responsive design. The easy to use and intuitive admin control panel is there to let you customize the theme. This panel can be used to change the appearance of the theme. The same admin panel also has options to set how the various theme elements behave. To let your visitors have perfect results in minutes, the theme is performance optimized. The theme lets you have posts with multiple pages. Voice lets you set different layout for different categories. Apart from all this, the theme has custom widgets to let you have additional features in your website. With this theme, you can show the number of visits of each post. The Voice theme has an inbuilt translation module for the theme translation. Optionally, you are also provided with .po and .mo files for translation. The theme has shortcodes that lets you have more features to be used in the theme. To let you earn through the magazine or news website, the theme has an inbuilt banner ad systems. To ensure your blog gets social love, the theme comes with an inbuilt social sharing system. 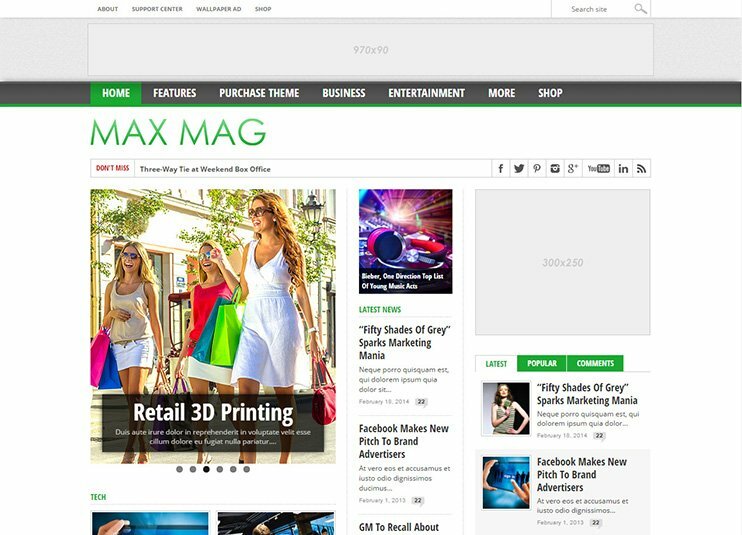 Max Mag is a responsive and retina ready news magazine WordPress theme that can also be used for blogging. The homepage can be set using the easy drag and drop options. Max Mag has a unique feature to display the recent posts on the category page using an attractive slider. The Max Mag theme has an advanced admin control panel to let you choose from the options and customize the theme. With this theme, you can choose the color scheme of the background. SEO optimized theme ensures that the website has a positive impression on the search engines. The Max Mag theme is translation ready and makes it possible to create a website in the desired language. To display your news highlights a news ticker option is there in the theme. NewsMag has two navigation areas so that you can display all the important links in the menus. NewsMag is also compatible with WooCommerce. So, if you ever want your blog site to sell some products for you, it is possible too. 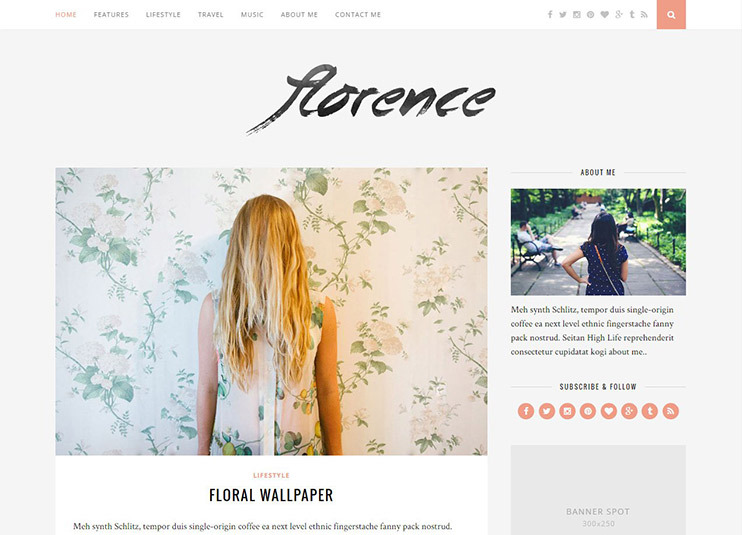 Florence is a responsive and clean theme for creating a blog site. The theme is perfect for creating simple but professional blogs. The theme has unique post formats for Standard Posts, Videos, Gallery and Music. Florence has the options to hide or show the elements. This makes it possible to control what the visitors see. The theme is highly customizable. The admin panel lets you set everything with easy options. In case you want to create a website in your own language, Florence helps you. The theme comes with localization files to let you create a translated website. Florence comes with social media integration to allow the social sharing of your blog post. 15Zine is a responsive and retina ready news magazine WordPress theme. The theme has a light and a dark version to choose from. 15Zine theme ensures that you won’t need any coding skill to customize the theme. All the customization options are provided through the intuitive admin panel. It supports mega menu that used ajax for the interactive design and transition effects. The theme supports infinite scroll, and infinite page load. You get the choice to choose from the different layouts for your pages, colors, icons, and fonts. To lets your visitors search freely through the website, the theme supports ajax based search. This feature ensures that the visitors get instant and relevant search results. The theme can be translated into the desired language. It can also be used to create a website in RTL orientation. To extend the theme functionality and use, a Child theme can be added. Braxton is a premium WordPress theme for magazine and news blog. The theme has numerous features and an elegant design. Braxton is not just Responsive but crafted carefully for the Mobile phones and Tablets. The theme allows infinite scroll on the category page or the blog page to display all the post without the navigating to another page. The theme supports embedded video and audio into the posts. For customizing the theme, there are unlimited options. These options can be accessed from the admin panel of the theme. To make changes in the theme appearance, no coding skill is required. Everything can be set as you want using the admin panel options. The homepage, which is the most important page of any website, can be built using drag and drop options. To allow the visitors to post their opinions Disqus comments is supported. Braxton is SEO optimized theme and allows the integration of content from Youtube, Vimeo, and Soundcloud. 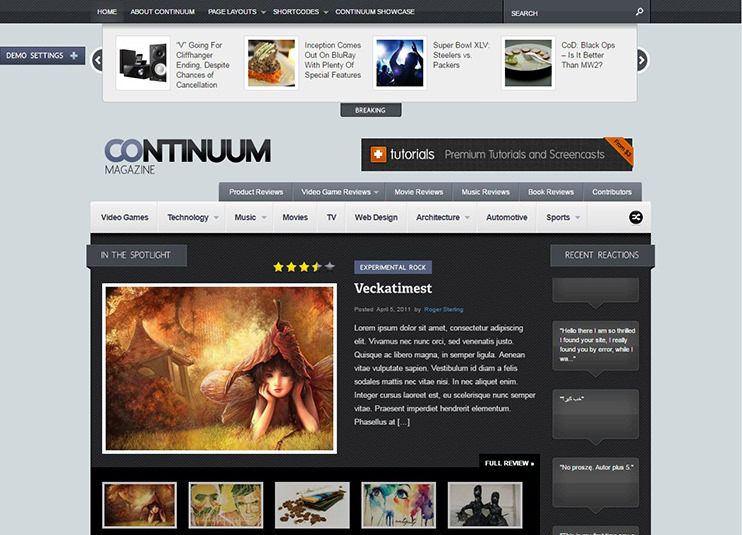 Continuum is a theme exclusively designed for blogging. The theme has features and flexibility that makes it possible for the theme to be used for any kind of website in 2018. If you want to post a blog that reviews a movie or a product, there are inbuilt review systems for these. The reviews pages for movie, games, books, products, and music comes inbuilt with the theme. The theme also has custom widgets that you can use wherever necessary. Besides, there is a number of short-codes available. There are more than 205 options to change and customize the theme. There are options for page templates to choose from. The homepage is totally customizable. The theme lets you focus on the content. It manages the rest itself. For advertisements management, it supports google Adsense. It also comes with in-built support for social sharing of your news, blog or reviews. 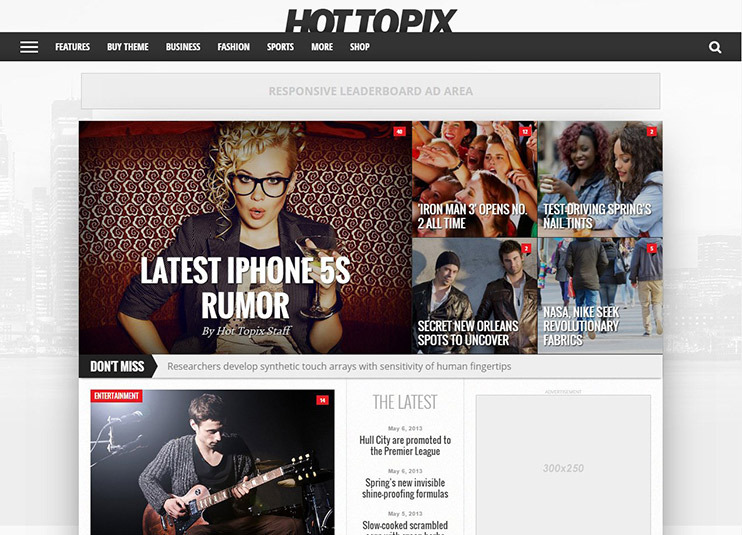 Hot Topix is a professional and typical WordPress news magazine theme. The theme is completely stand-alone. It does everything that a news/magazine website should do, without requiring any additional plugin. The theme has an advanced admin panel to let you set up the theme options. For minor CSS changes, the Custom CSS editor is available that lets you make changes without actually editing the theme. For important alerts, you can use the news ticker. The homepage of the theme can be set with drag and drop page building options. The theme come with the .po and .mo files. This means that the theme is ready for translation into the desired language. The theme is also compatible with WooCommerce. It lets you start selling any downloadable (or shippable) products online. Hot Topix is SEO friendly too. 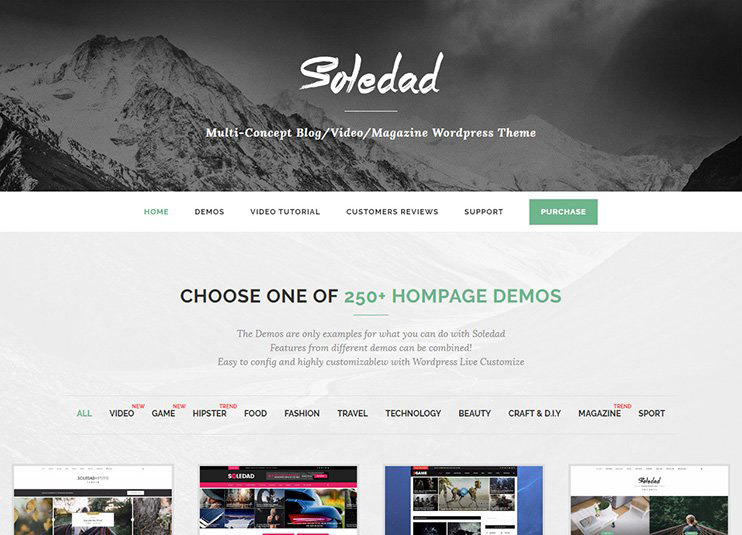 Soledad is an easy to use blog and magazine theme of all time. With 200+ slider and blog layout combinations, It’s not at all needed to explain how flexible the theme is. 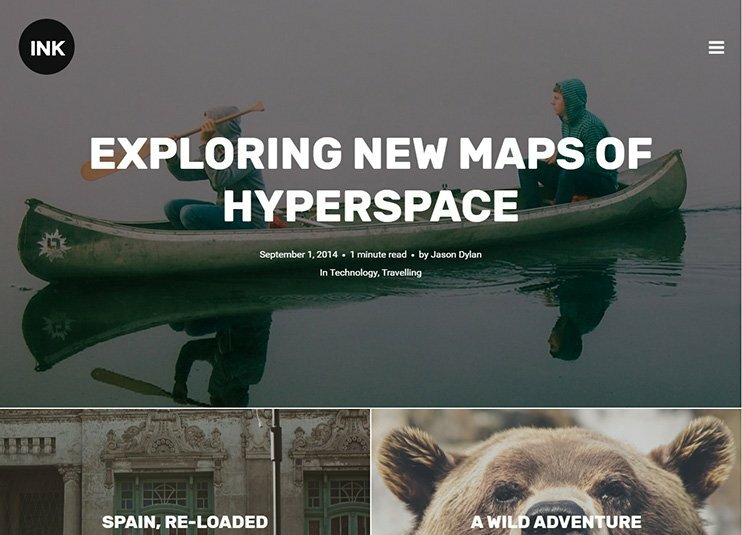 If you are looking for an easy to manage blog and magazine theme, this one is worth a try. Not only for its attractive looks but for the multiple options it provides to change the look and features of the theme to fit the user’s imagination. The theme already has 250+ demo homepages with variations to select from and the team promises to launch new with the time. It has pre-formatted 404 and Under construction, pages are readily provided. Even the mega menu has two different styles to choose from. The theme comes with the .po files to let you easily translate the theme into multiple languages. Hickory is a simple and beautiful theme for blog and magazines. The theme is flexible and highly customizable. Hickory allows you to choose from the available homepage layout. You can decide which layout is best for you and set it for your website. Later, customize it with the widgets to make it work exactly as you want. With Hickory, you can create multipage posts too. The blog page has four layout styles – Regular, Video, Gallery and review. The theme is easily customizable. There are lots of options to change the theme appearance. There are lots of custom widgets available with Hickory. These widgets can be used as and where required. The theme can also be used to create a website in any language. Videos are an amazing way to inform people. The theme comes with easy options to let you create and manage a video blogging or news website. The theme has a responsive design. It can be viewed from any device. The theme allows you to re-establish the homepage as per your needs. With lots of shortcodes and theme options, you can create exactly what you want. 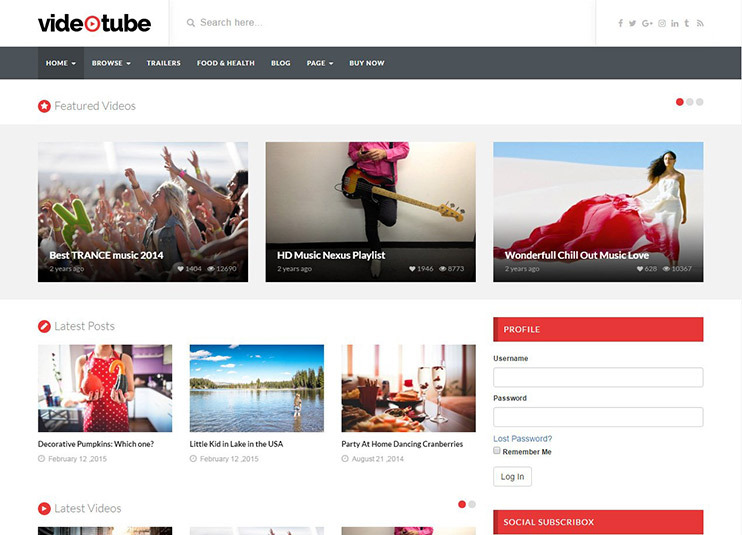 The theme allows you to embed videos from the most popular video sites or to upload video from your local drive. It also allows user registration and video submissions. The videos will come with a like button. It also has a view counter that shows how many times the video was viewed. So you can evaluate the popularity of a video on your site. The theme is translation ready. It can be used to create a website in any language you want. 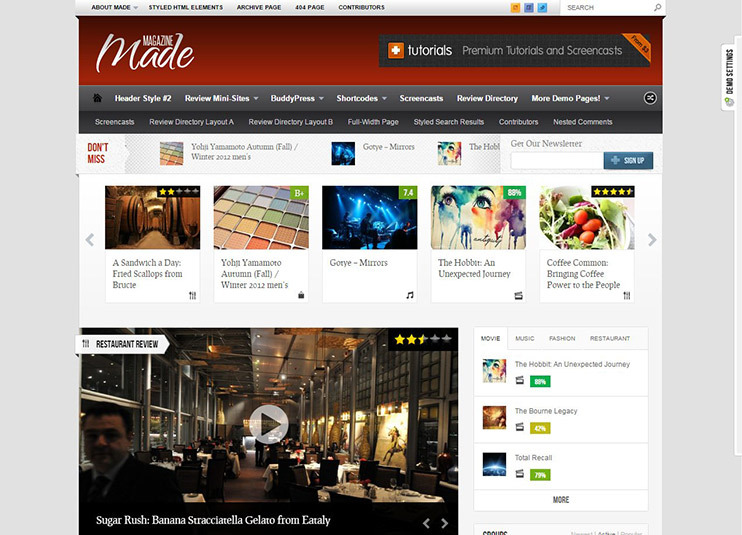 Made is a review/news website for BuddyPress. The theme has the potential to engage the users in your content and spend maximum time on your site. With the unlimited customization options, you can create a website you imagine. The theme has all the features for reviews and ratings. The ratings is automatically averaged and shown. It offers four ways to let your users submit their ratings. The site can also be used for creating a non-interactive website for reviews and news. Made comes with more than 80 shortcodes, 16 widget panels and 11 custom widgets. The theme also has custom ad spaces which can be used to display advertisement and earn money. There are about 150 theme options and more than 50 review options, that makes it possible to control the theme behavior and look. Also you can choose the size of featured image easily with the available options. Ink is a theme for WordPress blogging. The theme has a minimalist and clean design that focuses on the content. Ink theme has lots of custom widgets to choose from. The theme is SEO optimized to ensure good search engine ranks. It is responsive and has high quality and retina ready graphics. In this theme, you can embed content from Spotify, Sound Cloud, Vimeo and YouTube. The homepage of the Ink theme is totally widgetized. This means that you can change and re-order each and every content block of the home page. This theme also allows you to create a multi-page post. The theme supports Google Web Fonts. You can choose from those fonts to change the typography of your website. The restrict content pro plugin can be used into the theme to create a membership based blog website. Such a platform can be paid or free subscription based. To change the language of the website, .po and .mo files are provided for translation. 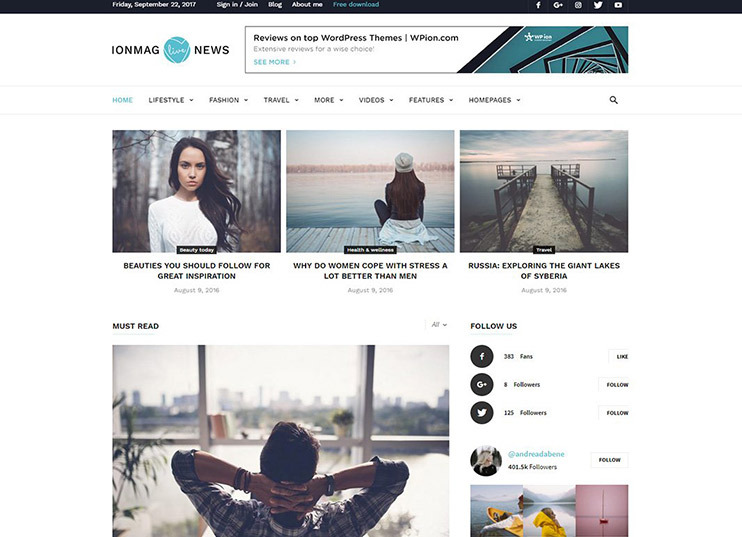 ionMag is a great premium WordPress Theme that can suit any blog, news, or magazine website. Developed as a flexible template, ionMag has an elegant, responsive and retina ready layout. It comes with powerful features, such as a custom, frontend, drag and drop page builder, a set of 16 premium themes, various header & footer styles, intelligent ad system, 21 custom widgets, and much more. With the one of a kind page builder, every change is happening live. You can mix and match over 100 handcrafted elements to create good-looking pages. If you are searching for a theme that can match your beauty, fitness, fashion, tech, baby, auto, art, or voyage site, ionMag could definitely be your choice. From post styles, category templates, to beautiful big grids, and a comprehensive theme options panel, this theme is worth taking into consideration. ionMag magazine WordPress theme is AdSense ready and uses the best SEO practices. This list will help you find out the best theme for your website in 2018 without much hassle. Just check the specifications and go for the one that is perfect for your site. With easy options and ample opportunities to customize, the themes are manageable and easy to use. When creating a news, magazine or blog theme, you will need more and more time to research, think and prepare your content. After all, Content is the king. So, save your time and concentrate on your content. Choose one from the list and get started with your site. Thank you for sharing this great theme collection. I really like all of the theme, Specifically I’m looking one clean theme for my website. Thanks for your comment! You are at the right place, Hannah. Nice collection of themes. Thanks for sharing! The collection here for everyone, Everybody will like this collection of themes. If you need any sort of help choosing between this themes please let me know your requirements so that I can come up with some suggestions for your website. Great list. I really like this collection and I found one for my blog. Thank you for your feedback! Which theme you’ve selected and why? Thank you for the inspiration! I bought Newspaper, perfect theme for my blog! I’m so happy with it. I’ve enjoyed going through the list the theme collection is great. Certainly, it is overwhelming with many great choices. Any suggestion for IT company separate blog. I’m looking something which easily get integrated with social media sites. For IT company basically, you’ll be having programming related blog for which I can recommend Buzzblog. Well if you have your own IT company and going to blog about development then I would suggest creating your own site which will be much more beneficial and helpful for your professional growth. Thank you for your suggestion Upendra. I’ll look into it. 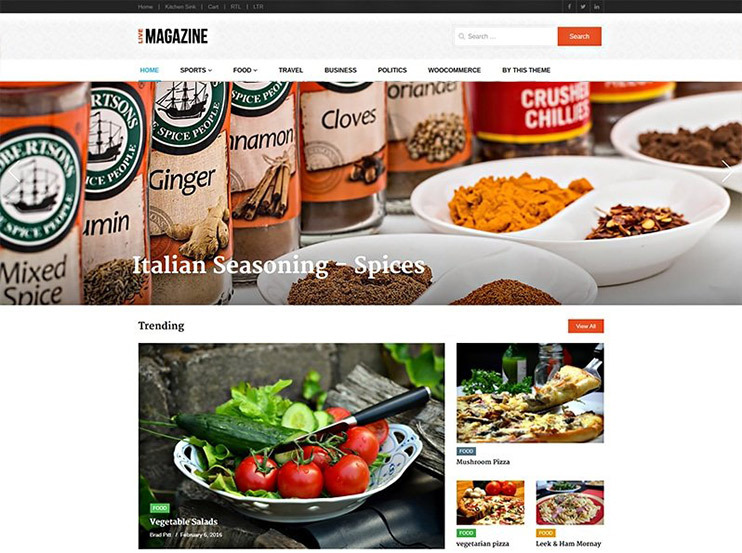 Awesome magazine Themes collection, I am using the rosemary theme and it is a great theme with solid contact form7 and AdSense integration. The list is very helpful. Each of this themes look awesome. I can show all of this theme to my clients. Thanks for the list. Thanks for the list really helpful information. Great collection of blog themes. I was searching for the good themes for my blog. I’ve gone through your list now its time to choose best for my blog. Feel free to let me know If you need any sort of help to choose the right theme for your website. A very informative, genuine and unique collection of “Best WordPress News/Magazine Theme”. Keep up the hard work Templatic 🙂 It would be great if you could mention Editorial on this blog. I believe this theme will bring more charm on your blog. This is my personal suggestion other things are up to you. May I suggest: theme-stop.com/themes/viral-mag/ which is a free popular magazine theme that I think would be of interest to your readers. I like the newspaper theme, I have an attraction for magazine style themes. A nice and unique collection. collection of themes looks extremely attractive. highly appreciated your list and views of best wordpress magazine themes. Nice theme collection. All themes are very useful and clean. I like it, but you can add one more theme by themeegg.com called Miteri WordPress theme. It’s very clean and beautiful looks with huge customization options. This is mainly applicable for Blogger who loves clean and beautiful SEO friendly theme.